This product is a non-selective herbicide that will kill any vegetation contacted. It enters plants through the leaves and moves down to the roots. This will ensure that the entire plant is eliminated. Avoid direct spray or drift onto desirable plants, lawn grasses, shrubs, and trees. Protect desirable plants and vegetation with a piece of plastic or cardboard. If desirable plants are accidentally sprayed, wash plants with water immediately. Do not apply this product in a way that will contact any person or pet, either directly or through drift. Only persons applying this product may be in the area during application. Do not mow, cut or otherwise disturb treated vegetation, weeds or plants for at least seven days following application. Do not use on or around edible feed or food crops. 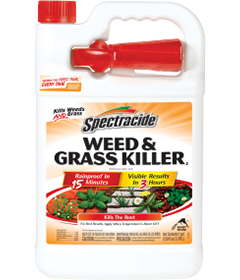 Use Spectracide® Weed & Grass Killer2 to kill the old lawn and existing weeds and grasses. Under dry conditions, water lawn every other day for a week before applying Spectracide Weed & Grass Killer2. 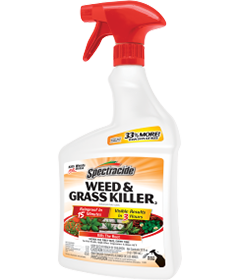 One gallon treats 300 sq ft.
Spectracide Weed & Grass Killer2 is pre-mixed and ready to use, and is formulated for “spot” treatment of weeds and grasses. Use it on driveways and walkways, or around fences, trees, flower beds, shrubs and other areas in your yard. Completely cover the leaves of the target vegetation. Do not overspray. Sprayed plants begin yellowing and wilting in about 24 hours, with complete kill, including the roots, in one to two weeks. *Visual symptoms and time to complete kill will depend on weed and grass type, temperature and application rate. Remove sprayer from its slot beneath the bottle handle and unwrap the tubing. Pull hose plug to completely extend tubing. Firmly press hose plug into opening in cap until it snaps into place. Adjust nozzle to desired setting, SPRAY or STREAM. Hold sprayer below the level of the container and prime by pumping trigger several times until product is dispensed. To store, turn sprayer nozzle off. Return sprayer to its slot. Hose can be pushed back into sprayer handle. Pesticide Storage: Turn the nozzle to “OFF” position and store with sprayer above the level of liquid in container to prevent leakage. Pesticide Disposal: If empty: Nonrefillable container. Do not reuse or refill this container. Offer for recycling, if available. If partly filled: Call your local solid waste agency for disposal instructions. Never place unused product down any indoor or outdoor drain. Wear long-sleeved shirt, long pants, shoes and socks. This pesticide is toxic to aquatic invertebrates. Do not apply directly to water or to areas where surface water is present or to intertidal areas below the mean high water mark. Do not contaminate water when disposing of equipment washwaters or rinsate. To protect the environment, do not allow pesticide to enter or run off into storm drains, drainage ditches, gutters or surface waters. Applying this product in calm weather when rain is not predicted for the next 24 hours will help to ensure that wind or rain does not blow or wash pesticide off the treatment area.